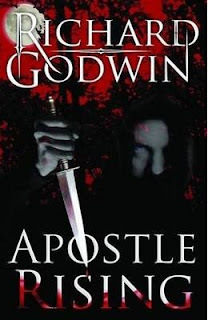 Euro Crime has 6 copies of Apostle Rising by Richard Godwin to giveaway. To enter the draw, just answer the simple question* and include your details in the form below. *The answer can be found in the Bibliographies section. This competition is open to UK & Europe residents and will close on 30 April 2011. Detective Chief Inspector Frank Castle never caught the Woodlands Killer and it almost destroyed him. Now years later, mauled by the press, and traumatised by nightmares, he is faced with a copycat killer with detailed inside knowledge of the original case. He and his partner DI Jacki Stone enter a deadly labyrinth, and at its centre is the man Castle believes was responsible for the first killings. He's running a sinister cult and playing dark mind games with the police. The investigation has a shattering effect on the lives of Castle and Stone. The killer is crucifying politicians, and he keeps raising the stakes and slipping through their hands. Dark coded ritualistic killings are being carried out on high profile figures and the body count is rising. Castle employs a brilliant psychologist to help him solve the case, and he begins to dig into the killer's psyche. But some psychopaths are cleverer than others. 'Apostle Rising' is an extremely powerful Noir Crime story that contains a unique twist, timed to perfection by the author. It is a dark, layered narrative with detailed psychological profiling, and a chilling dimension of horror. Just found this blog I will follow if you dont mind I love crime reading. it hasn't come through. I tried a test and it was ok, so do you want to try again?